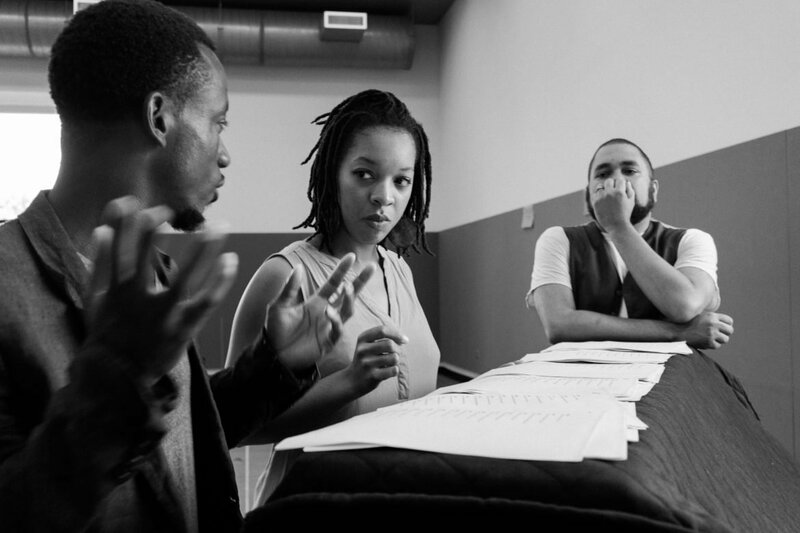 Antonio Duke (left), Ashawnti Sakina Ford (center), and Derek "Duck" Washington brainstorm around a piano in a Guthrie rehearsal room. Photograph by Annabelle Marcovici. “It was kind of a whimsical artistic impulse,” recalled Antonio Duke, as he reminisced on this past spring when Ashawnti Sakina Ford drove him home each night after their rehearsals for a production of “Imaginary Invalid,” a play by 17th-century French actor and playwright, Molière. The pair started reaching out to their communities, pitching their idea and were met with overwhelming support. “We didn’t have the funds to produce it yet, but people were so willing to [jump in],” said Sakina Ford. “I didn’t know people needed a Black theater company.” Fewer than three months after “Imaginary Invalid” closed, Sakina Ford and Duke launched the Black Ensemble Players with a Kickstarter campaign to raise money for the company’s first production: “A Midsummer Night’s Dream.” This popular Shakespeare play is a comedy that includes a royal wedding, various young lovers, fairies and a great deal of mischief. 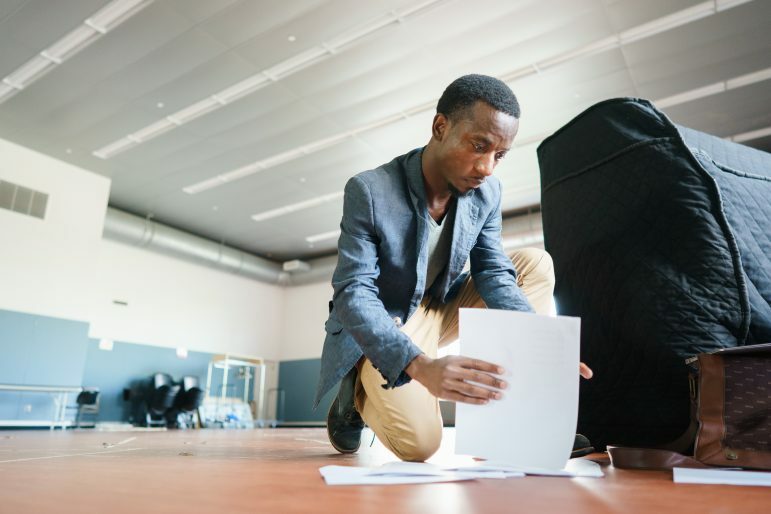 Black Ensemble Players Assistant Director Antonio Duke looks over scripts before the group gathers to film a promotional video in a Guthrie Theater rehearsal room. Photo by Annabelle Marcovici. During Shakespeare’s time, England declared itself an empire. It created its first colony, Roanoke, in the Americas, raided Spanish ships full of riches from West Africa and the West Indies, laid the foundation for what would become the East India Trading Company. The East India Trading Company began engaging in the devastating human trafficking of African captives also known as the transatlantic slave trade. Though Shakespeare saw only its beginnings, the British empire eventually colonized parts of North America, Australia, Africa and South Asia, redefining borders, condemning millions to permanent and intergenerational enslavement and imposing their culture and language across the world. A line in “Midsummer” particularly stuck out to Sakina Ford – one of the two main characters calls another young female character an “Ethiope,” making a joke about the mud covering her friend’s face from her excursion in the woods. Black actors have to reconcile the idea that Shakespeare wrote these racist words into his play, with the fact that his plays offer opportunities for actors to play, explore and grow. Twin Cities playwright Carlyle Brown shared similar sentiments, noting that when Black actors attend conservatories – schools dedicated to training in performing arts – they are taught in a Eurocentric context. Conservatories often operate using European “classics” of literature and teaching as the main – and sometimes only – texts and methods. This forces actors to conform to the standards of Western speech and behavior. These values are upheld in the US especially, Brown argued, because white American culture is often defined as the norm, the superior and the antithesis of Black American culture. Actor Ira Aldridge encountered this in 1824 when he became the first Black person to perform Shakespeare in England. He portrayed Othello, a Moorish general who marries a Venetian noblewoman. Despite his race being central to the play’s plot, the character of Othello had always been performed by white men in blackface. It was only three years ago that New York’s Metropolitan Opera performed Italian composer Giuseppe Verdi’s opera “Otello” without putting their white lead in blackface. When Aldridge performed at London’s Theatre Royal, critics compared him to a horse or dog, said he was “threatened with DAMNATION” and called his performance a “violation” of Shakespeare. Nearly 200 years later, performer Debra Ann Byrd was told by an acting teacher that as a Black actor, she would not have a career in “the classics.” She went on to found the Harlem Shakespeare Festival, giving Black actors opportunities to perform Shakespeare. Brown noted that American actors in general often struggle with Shakespeare because they often attempt to adopt British accents and what they think are aristocratic mannerisms. This caricatures Shakespeare’s characters as the idealized upper class, when in fact, many of his plays, including “A Midsummer Night’s Dream,” give stage time to characters from all walks of life. In contrast, Brown remembered a Black production “Comedy of Errors” that he saw at the Oregon Shakespeare Festival. “I don’t know if you could say they did it ‘Black,’ but they did it by themselves,” he said. Without changing the original language of the play, Director Kent Gash set the play in the Harlem Renaissance, drawing on cultural history and his and his actors’ life experience to re-interpret the play. Setting Shakespeare plays in different times and places is common and not unique to Black theater makers, but because Black history is one of unique struggle and cultural innovation, there is a special significance to culturally-specific adaptations of this nature. Black culture is well known for its linguistic genius and as a major source of American English’s ongoing evolution and vitality. “Black vernacular is very suited to Shakespeare because it’s very percussive,” noted Brown. In their all-Black production of “A Midsummer Night’s Dream,” the Black Ensemble Players will create a space where they can explore Shakespeare’s words “on their own terms,” as Duke said. Erin Farsté (left) and Derek “Duck” Washington (right) warm up by improvisationally adding movement to a cold script reading. 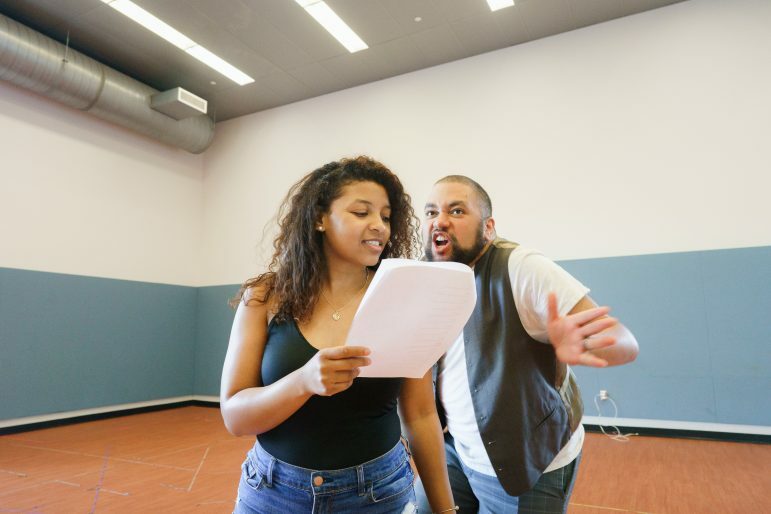 “I took the chance to have two actors embody the text since Shakespeare has a lot of movement and rhythm in his speech,” Director Ashawnti Sakina Ford said of the exercises. Photo by Annabelle Marcovici. The play’s spirituality lies at the heart of what both Duke and Sakina Ford want to reclaim. “What happens if we make it Black spirituality,” wondered Sakina Ford. Their production will turn its spiritual focus to the Yoruba Orishas. The Yoruba people come from West Africa, in what is now southern Nigeria, Togo and Benin. Their religion has a complex set of gods, the Orishas, who act as intermediaries between humans and the divine, each controlling a different aspect of the natural world. One story tells how Eshu, the trickster Orisha, once convinced the sun and moon to switch their places in the sky, creating a sunny night and starry day. Duke has been studying the Orishas and incorporating them into his original works since seeing Tarell Alvin McCraney’s Brother/Sisters plays, which tell the stories of particular Orishas, including Eshu. In “A Midsummer Night’s Dream,” Puck’s antics of breaking up couples and turning human heads into donkey ones, Duke sees Eshu. “The way these character arcs resonate with Yoruba cosmology is just so striking, and I find Shakespeare’s text so universal in that way,” said Duke, finding some reconciliation between his African ancestry and his love for the white English playwright. You can find out more about the Black Ensemble Players on their Kickstarter page, which wraps up on August 11. “So often the terms and phrases applied to African American youth are negative: at risk, inner city, thug, gangster,” said Gary Hines, a three-time Grammy award winner and music director of the ensemble Sounds of Blackness.